These experiments are costly, not only in terms of the cost of equipment also due to consumption of the chemicals. This is one area where in silico modeling can be used to augment experiments. The Toxicity Module in ADMET Predictor® contains several models to predict in vitro experimental endpoints. Of course, this method does not consume the chemical and they can be applied to virtual compounds. In vitro experiments can indicate that a compound is highly potent and therefore toxic but it must be present in sufficient concentration in the tissue or organ in order to produce in vivo toxicity. 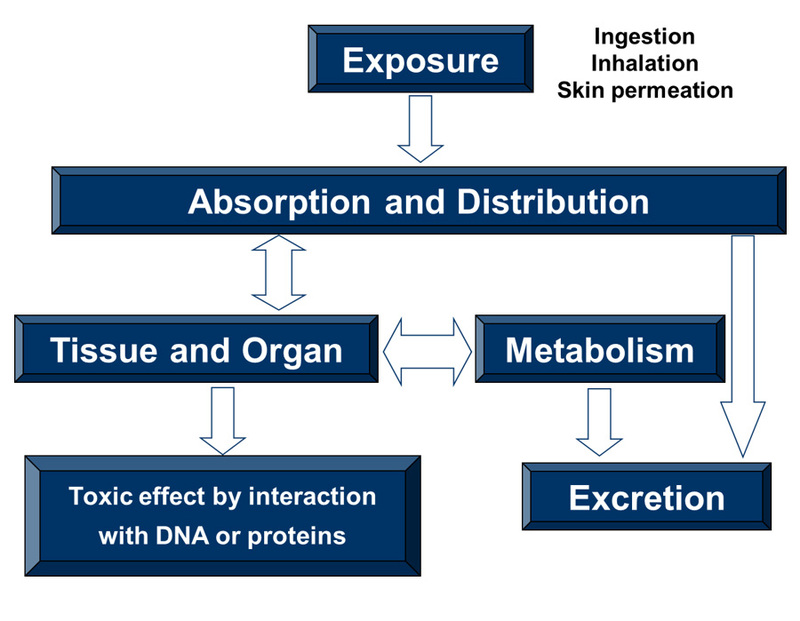 The image below illustrates the possible fate of a toxicant. The first step is exposure of the chemical to a species. This can occur via oral ingestion, inhalation, or skin contact/permeation. The chemical can then be absorbed into the blood stream and distributed throughout the body and into various tissues and organs. High metabolic clearance of the chemical can reduce its toxicity. All of the above processes can be simulated in GastroPlus®. Furthermore, the ADMET Predictor module in GastroPlus can predict all relevant properties in order to perform a full PBPK simulation. For example, one can simulate an oral rat acute toxicity test. GastroPlus will predict the fraction absorbed (Fa) using it Advanced Compartmental Absorption and Transit Model (ACAT™). Low Fa values result in reduced chemical exposure. The compound can be metabolized in the gut wall and the liver by various enzymes including cytochrome P450. This further reduces the chemical’s exposure. Bound and unbound concentrations in various tissues are also predicted in the simulations. If these concentrations are lower than the in vitro IC50 then this is evident to support that in vivo toxicity will not be observed.